Featured on The Australian Coeliac magazine of September 2017. When following a gluten free diet, it’s easy to become fixated with searching the grocery aisles for products that carry a gluten free claim, arriving at the checkout with a trolley full of packaged processed foods, which is not a particularly healthy way for anyone to shop. While products labelled gluten free or carrying the Crossed Grain Symbol are safe choices for the gluten free diet, it is important to remember all the naturally gluten free foods that are required to maintain a healthy balanced diet. Naturally gluten free foods are reliably gluten free, don’t require much label reading (if any) and can be found in every food group. We go back to basics and focus on just one basic food item, bananas. Hereunder are a number of reasons why bananas are so appealing. It is important to emphasise that the focus here is on gluten free and coeliac disease. Bananas might not be the ideal fruit for persons suffering from other conditions and, if you are, it is advisable that you always consult your medical practitioner or consultant before following any recommendation/s appearing in this article. Athletes and sportspeople love to eat bananas before, during or straight after training. This is because the natural sugars released during the digestion of bananas fuel the muscles, making it the perfect sports snack. In fact, research suggests that having two bananas an hour (with water) works just as well as sports drinks on a 75km bike ride. Carbohydrate snacks are very useful for raising low blood glucose levels and overcoming the mid-afternoon slump many people experience. Healthy blood glucose control is helped by snacking on carbohydrate foods every 2-4 hours to keep levels steady. It is thought that wholesome carbohydrate snacks help with clear thinking, improved memory and mood. Bananas are ideal because of their low Glycaemic Index (GI) and zero fat content. The GI is a relative ranking of carbohydrate in foods according to how they affect blood glucose levels.A ranking of 55 or less indicates a carbohydrate is more slowly digested and has less impact on blood glucose levels (www.glycemicindex.com). The average GI of bananas is 52, even less for under-ripe bananas that have a higher starch content and lower sugar. This makes the banana a particularly good fruit choice for people with diabetes. Bananas are the best fruit source of vitamin B6. One banana provides about 15 per cent of adult daily needs. Vitamin B6 helps with the production of neurotransmitters, including serotonin and gamma-amino-butyric acid (GABA). The older you get, the more B6 your body needs. The banana is also a source of vitamin C, along with modest amounts of the B group vitamins niacin, riboflavin and pantothenic acid. Antioxidants are known for playing a role in reducing the cell damage that leads to certain diseases. Scientific research confirms that bananas have significant antioxidant power, helping to protect the body from future disease via their positive effect on blood and nerves. Bananas have antioxidant compounds such as vitamin C and phenols. In addition to the medium-sized bananas, many retailers now stock the smaller ‘lunchbox’ banana, which is perfect for school kids who prefer a smaller serve. In fact, anyone with a small appetite or those who just like frequent snacks can dine on the convenient lunchbox banana. This unique tropical fruit is extremely high in potassium and salt-free, making it perfect for a healthy blood pressure. Australian and international research suggests that a diet high in potassium and low in salt helps to keep blood pressure normal. It is reported that less than one in ten people get enough potassium to reduce their risk of chronic disease, like stroke. That leaves a lot of room for high potassium foods like the banana. We all know that high fibre foods help keep you regular and prevent constipation. The fibre in bananas can go a long way in helping restore normal bowel action, without resorting to laxatives. A medium banana will provide about 10% of your fibre needs for a day. The banana is also the best fruit source of resistant starch, a type of starch known to help protect you against bowel cancer. Bananas are very filling for the amount of kilojoules they provide, leaving you feeling satiated without adding too many unwanted calories. If you are trying to maintain a healthy weight, it is recommended that you eat plenty of fruit and vegetables and limit fatty foods. One medium banana has only one third of the calories you find in a small pack of crisps or corn chips and fewer calories than in a single chocolate biscuit. Choose your snacks wisely; the banana is a great choice. Everyone knows that the banana goes from green to yellow over a week or so. When you buy some yellow bananas, also buy some green ones. By the time the yellow ones have been devoured, the green ones will have ripened. You can delay ripening by placing bananas in the vegetable crisper of the fridge. The skin will probably turn brown, but the flesh inside will still be delicious. 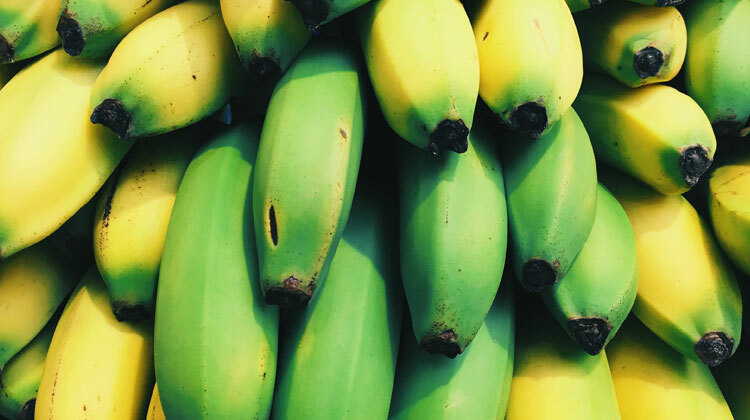 If you need to speed up the ripening process, try placing your bananas in a fruit bowl with other ripe fruit, or put bananas in a paper bag with a ripe fruit (e.g. apple or avocado). The natural ethylene gas produced by the other fruit and the banana will circulate in the bag and speed up the ripening process. Folate is vital in the development of a baby’s spinal cord in the womb. It is so critical that the vitamin is recommended as a supplement to women of childbearing age. An overwhelming body of evidence has linked adequate folate in early pregnancy to a lower risk of neural tube defects, such as spina bifida in infants. One banana will provide over 10 per cent of your folate needs each day. Glenn Cardwell is an Advanced Accredited Practicing Dietitian with 37 years in clinical and public health nutrition, including 10 years as consultant dietitian to the National Heart Foundation, five years at the Children’s Hospital in Sydney, and was a major player in establishing the WA School Canteen Association in 1994. Horticulture Innovation Australia delivers more than $100 million in research, development and marketing activities across the horticulture industry each year with funding from the Australian Government, grower levies and other sources.